The next week I returned to the Thunderdome to join one of the New Skater Sessions. These sessions are designed for those who have never skated before, all the way up to new team members in training. They teach you all the skills you need to be able to skate and fall safely, and they run weekly on Monday evenings from 7 to 9pm. On arrival there were quite a few people already kitted up and waiting to get started. I was pretty nervous, as I’ll try anything once, but it’s a bit different when it’s a skill which requires practice, and you haven’t had much. The last time I put on skates I was about 6 and I had these Care Bear skates that you strap onto your shoe, so yeah, I wasn’t very confident I would be any good. So I signed in, signed my life away, and went to get kitted up. If you’ve not skated before you’ll probably need a bit of help with this bit, but thankfully there were a few people around who looked like they knew what they were doing, so I asked for help, and gladly got some. After finally finding a matching pair of knee, elbow and wrist pads that fitted, I got some skates on, and the session began. We all start in the centre of the rink, which, is quite a feet in itself when you’ve not skated for 27 years. I managed to stand up (yey!) and was thankfully escorted into the centre by team captain Rampant Ratchet, who held my hand while I wobbled over to the group. Once there my first task was learning how to just stand up without falling or my legs hurting! Turns out my biggest lesson for the day is to bend my knees! As a brand new skater I stayed in the centre of the rink with a few other novices while the majority of the group moved out to the track to practice maneuvers and technique. It was a nice small group to work with, and made me feel a little less useless, even if I was the least experienced there. First up I learnt to skate up and down, and very slowly, while not falling over! Once I had basic ‘moving’ down, I was given the most important lesson, how to fall. The first time is a bit nerve wracking, but those knee pads are amazing! It’s actually quite comfy when you go down if you do it right. Throughout the evening I learnt how to do double knee falls and single knee falls. I also did quite a few unofficial ‘on your bum falls’, but this isn’t an approved method, and is far from painless, so not recommended if you can avoid it…..
We also moved on a little to T Stops, but I was pretty rubbish at this because I struggled to just lift one foot off the ground while still moving. I practiced a bit and got some very small attempts in, but I have a long long way to go. While I wasn’t expecting the session to be easy, I was really surprised at how knackering it was! Even though I was only doing the basics, and barely even any skating, my legs were aching and I really worked up a sweat. I guess it gets easier with practice, but Roller Derby definitely is a full body workout. After the session, I spent the next week making strange noises when I stood up or sat down. It really hits you hard, especially if you don’t stand properly like me. 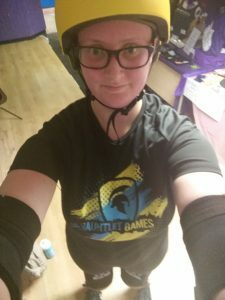 I really enjoyed my first skating session, and while I don’t think this one is for me in the long run, I’m glad I tried it, and I think it’s worth checking out for anyone looking for something a bit different. What’s really nice is the sense of comradery among the women (and men). 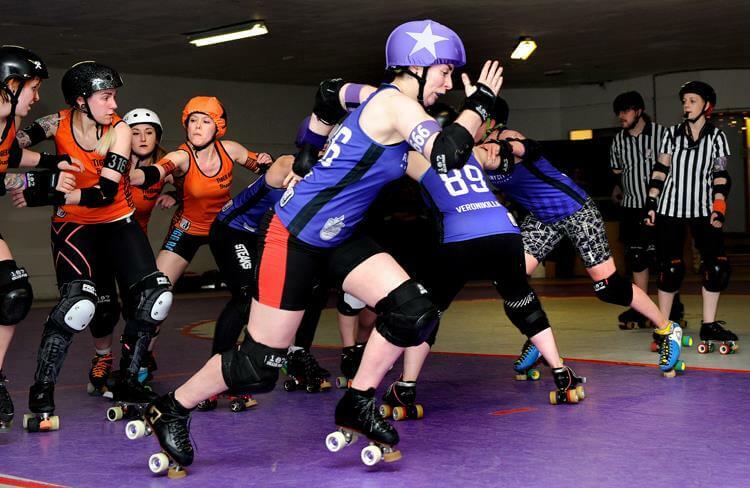 Even though it’s a full contact sport, everyone is super friendly, and the roller derby community looks like a fantastically diverse, accepting and great community to be a part of. If you’re interested in joining one of Rainy City’s New Skater Sessions, or would like to head over to watch a match, you can find more information on their website here.